44 Second Avenue between 2nd and 3rd streets. It is startling sight when, after darkness has fallen, you suddenly notice a polychrome statue – now illuminated – of the Madonna set in a nondescript façade of a building on Second Avenue. 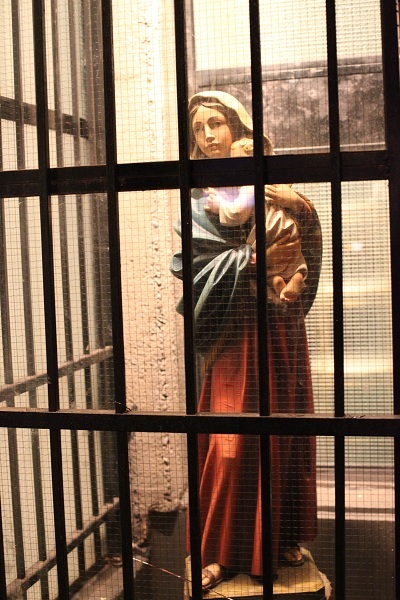 For the Virgin Mary stands imprisoned behind bars and Plexiglas. Probably the builders of this edifice feared – with good reason – that the local residents would otherwise swipe the devotional image. For this is a church – built in a very difficult time in what had become a very “dodgy” part of the city. The architecture, moreover, reveals that the crisis of the economy and security in 1970’s New York was accompanied by an equally severe spiritual crisis in the Catholic Church. For the statue behind bars is about the only memorable feature – even if unintentionally so – of this church. A very neat and chaste altar, with rich gilt candlesticks, a painting of the crucifixion as an altar-piece, with paintings of the Annunciation and the Assumption of our Lady at the sides, showed that the edifice was to be used for a purer and holier faith. Bishop Hughes dedicated the church that same year (1842) before an impressive crowd – many of whom were not Catholic. (Above) Church of the Nativity in 1878. A fire destroyed much of the interior of this church in 1912; a thorough renovation had been completed by 1913. Yet as time went on this parish fell on hard times. Already in 1914 the congregation, if still solid, was small compared to some sister parishes and diminishing. 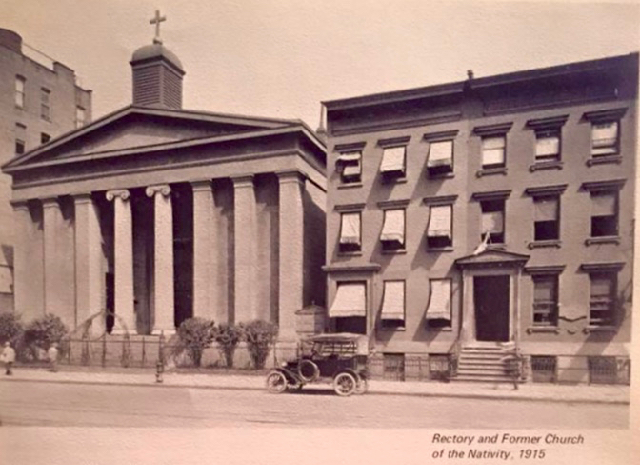 In 1917 Nativity parish was entrusted to the Jesuit order, which was already established in the nearby parish of Our Lady of Loretto (another church of the poor). In 1966, the old church was closed, when a dangerous condition involving the roof was identified. Alleged “structural and financial” considerations made creation of a new roof impossible. In 1968 the magnificent old church was razed. But a new church was built to continue the parish and opened in 1969. 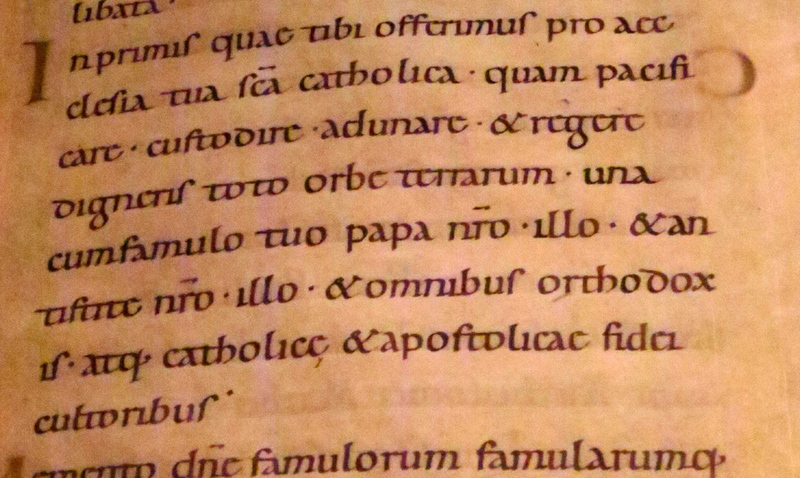 The organization and apparently the funding of the project of building the new church seem to have been the responsibility of the laity of the parish. In this not at all wealthy neighborhood the congregation’s zeal and drive to keep their parish alive remained vital even at that time of decline of the Church and the City! Inside it is even worse. For Nativity church is nothing but a cinderblock gymnasium, with built-in structures (also in cinderblock) that serve as a sacristy, confessional etc. The furnishings, scattered about this space, range from the merely adequate to the awful. The architecture does not focus on the “sanctuary”, which is just stuck against one side of this room. 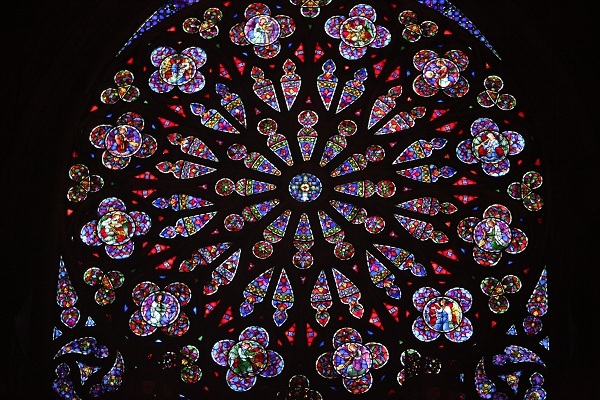 There is nothing but bright artificial light – the “windows” seem to be merely decorative. Once again we observe that, in the Conciliar era, the Church adopts a new architecture that consciously seeks to make an anonymous impression on the streetscape. (The equivalent in “suburbia” is to move the church from town center to its outer edges – removed from sight but with easier parking). The style of these ecclesiastical structures would be equally conducive to industrial or institutional functions. 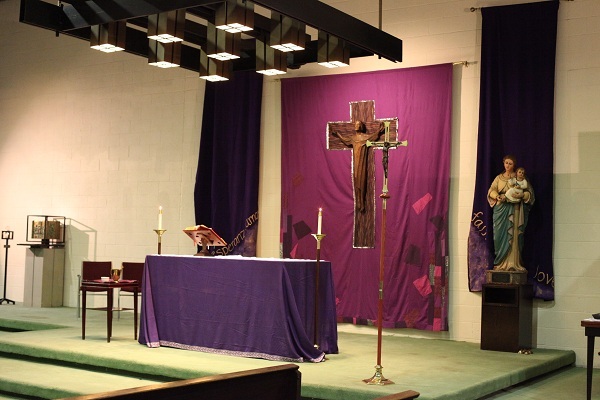 The interior of a church like Nativity, for example, could easily serve with very little change as a warehouse, an automobile repair shop or, as already noted, a gym. 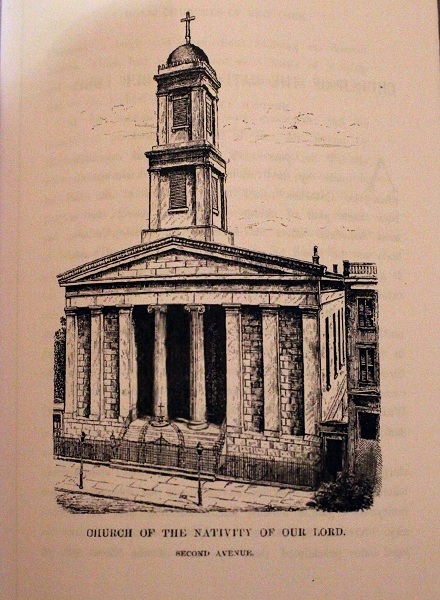 Compared to this, the original Presbyterian temple was the essence of Christian art. 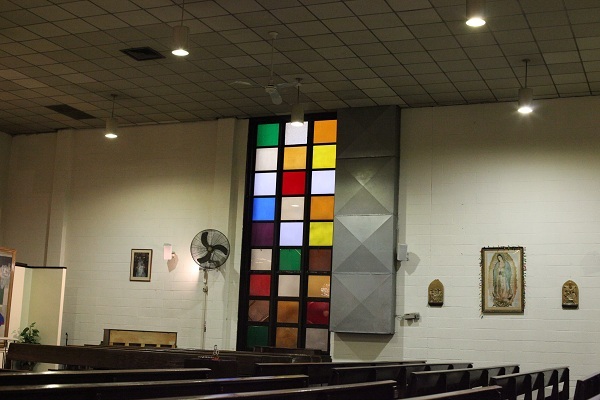 Nativity parish undoubtedly had limited financial means in 1969, but even the poor deserve much better than this. What a contrast with the achievements of the parish priest who founded Nativity in 1842 – he assuredly also presided over a mostly impecunious flock. And at that time there was no vast Archdiocesan structure for support! 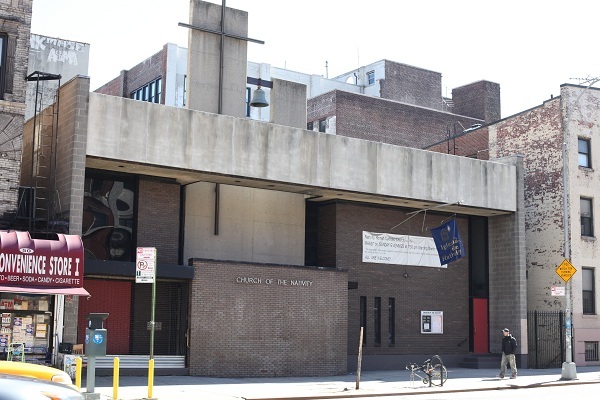 Now the most recent claim to fame of Nativity was the requiem mass for Dorothy Day held here in 1980, attended by the entire Catholic radical crowd. One of her foundations, Maryhouse, is around the corner from this church and she also had worshipped here. Were she and her Catholic worker associates aware that to inflict architecture like that of Nativity on the poor – to deprive them of beauty – is perhaps just as great a scandal as economic oppression? I do not know – but I have my doubts. As one admiring biographer of Day, describing her Requiem Mass at Nativity, puts it: “The church’s interior was fittingly modest, with linoleum floors, unpainted cement block walls and watermarks on the ceiling.” (Roberts, Nancy L., Dorothy Day and the Catholic Worker, at 169 (SUNY Press, 1985)). The misguided logic of Catholic aesthetic progessivism couldn’t be more clearly stated. 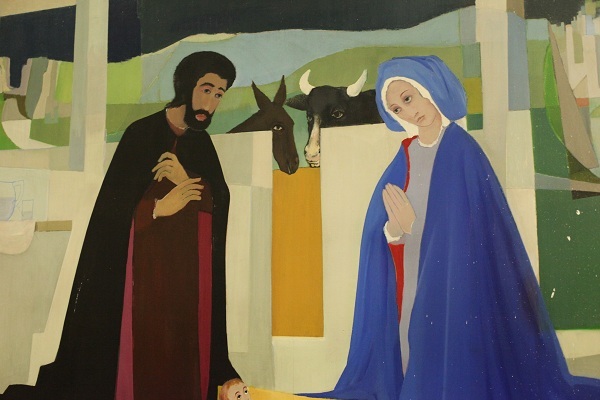 Nor do we know how long Nativity may survive. In the last Archdiocesan “realignment” it was demoted – after 165 years – from its status as a parish. Certainly, if further cuts have to be made, there are vastly more important edifices to save in the immediate vicinity – like Most Holy Redeemer! Yet it is a tragedy to lose even the least significant church in the city. Upon a recent Ash Wednesday, a congregation of perhaps fifty was present: families and not a few younger people (students at NYU?). 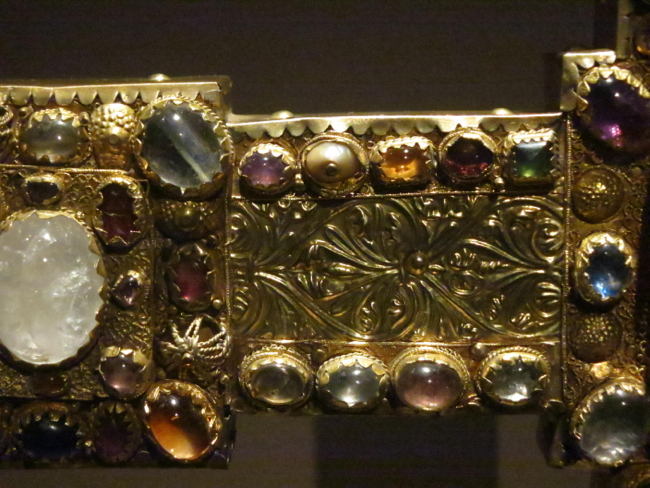 They heard a liturgy that was sincere but revealed very little of the richness and beauty of Catholic Tradition. The spiritual need of these parishioners is clear as is their willingness to make sacrifices for their religion. 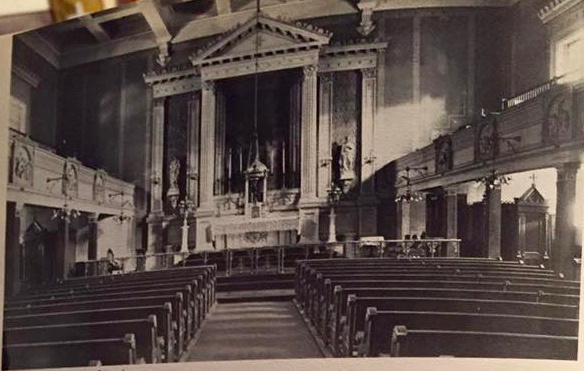 But do the Catholics of New York – clergy and laity – still realize the necessity of making available to them the spiritual and artistic treasures of the faith – as did the valiant founder of this church and his congregation in 1842? UPDATE: Nativity parish has been closed. The statue of the Madonna described above (called the “Madonna of the Streets”) is now in Most Holy Redeemer church (as is the Nativity scene pictured above).